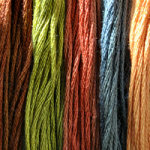 Classic Colorworks threads are exciting and fun to stitch with, and give your needlework a unique look. The beauty of a thread skein hand dyed is that it provides the subtle color variations we have all grown to love in our stitching. Your needlework projects stitched with "Classic Colorworks cotton flosses" will never be a carbon copy of everyone else's because each skein is unique in itself. Consistent, lightfast, colorfast, with heirloom quality and longevity, but as with any hand done process, there can be slight variations within each dyelot, which will make each stitched piece uniquely your own. This conversion chart is approximate as it's difficult to capture the color shading within the hand-dyed fibers, and also due to dye lot changes. The suggestions here are not provided by either Classic Colorworks nor DMC, but rather was put together using the dye lot in stock at the time of the matching. The look you get with DMC will not resemble the pictured model of the design you are converting from due to the subtle shading of color within each strand of Classic Colorworks. Note. DMC Numbers containing / indicate that you are using one ply of each of the two colors together - a blended needle.